JOHN TYLER. Autograph Letter Signed and Autograph Manuscript Signed several times in the third person. 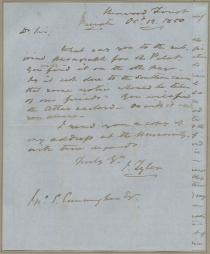 Sent to S. Cunningham, from Sherwood Forest, October 12, 1850, 1 p., 9⅜ x 7¼ in. 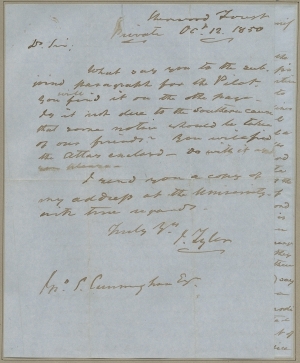 on blue paper marked “Private,” being the cover letter for the manuscript, written for anonymous publication: “The fugitive slave bill and Commissioner Gardiner,” [ca. October 12, 1850], 2 pp., 9⅜ x 7⅞ in. on blue paper. What say you to the subjoined paragraph for the Pilot. You will find it on the other page. Is it not due to the Southern cause that some notice would be taken of our friends? You will find the Atlas enclosed. Do with it as you please. I send you a copy of my address at the University with true regards. The first case which has arisen under the Fugitive slave law, came before Commissioner Gardiner of New York. The fugitive was promptly dealt by and restored to his owner in Baltimore. Mr. Gardiner has proven himself to be a faithful public servant, an honest man, and a Patriot. And yet, by a certain class of Editors in New York he is sneered at, and an effort is made to excite dislike towards him on the part of the public. 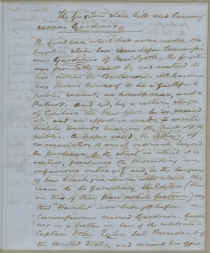 A paper called the Atlas, of no circulation of much moment beyond the purview of the street in which it is edited, proclaims the proceeding “an infamous outrage”; and, in the language of low black quadroon with which they seem to be familiar, the Editors (there are two of them, pars nobile fratrum) say that “Hamlet was brought before a Commissioner named Gardiner. Gardiner is a brother in law of the celebrated Captain John Tyler, late President of the United States, and received his office <2> at the hands of that functionary.” Now what jackasses are Mssrs Herricks and Ropes, the Editors? 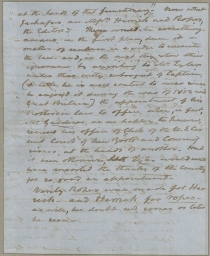 These would-be somethingarians, in the first place, deem it a matter of censure in a judge, to execute the law—and, in the next they show their ignorance by ascribing to Mr. Tyler under their witty soubriquet of Captain (a title he is well content to wear since he enjoyed it during the war of 1812 with Great Britain) the appointment of his brother-in law to office, when, in fact, Mr. Gardiner, as we happen to know, received his office of Clerk of the U.S. Circuit Court of New York and Commissioner, at the hands of another. Had it been otherwise Mr. Tyler would well have merited the thanks of the Country for so good an appointment. Verily Ropes was made for Herrick—and Herrick for Ropes—as will, we doubt not, sooner or later be seen. Part of a collection assembled for Augustin Daly, ca. 1889-1893 (American Art Association 19 March 1900, lot 3122), sold to — the celebrated New York dealer George D. Smith—resold by Smith in or before May 1900. John Tyler died in Richmond, Virginia, on January 18, 1862, loyal to the Confederate States of America; his coffin was draped with the Confederate Stars and Bars, rather than the Stars and Stripes, under which he had served as chief executive.